After attending a football game in which Stargirl runs across the football field playfully cheering and stirring up the crowd, she is asked to join the cheer leading squad. Students began to like her. 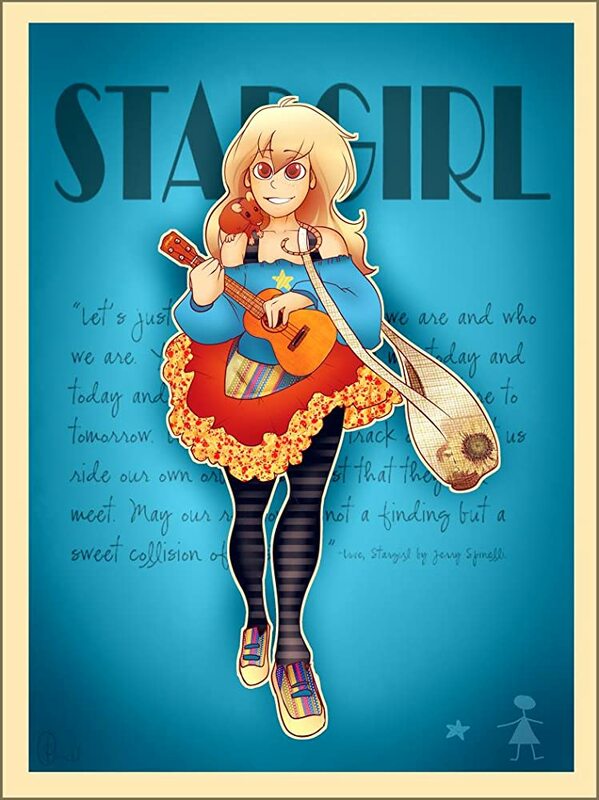 At this point, students love Stargirl’s upbeat, quirky actions. People begin attending the football games, not to watch the game, but to see Stargirl’s playful antics including cheering for the opposing team. By Thanksgiving, Stargirl is the most popular person at the school. Enjoy this free activity. This link takes you to Google Slides. Choose between the online and printer friendly versions. Students answer four questions to compare different characters in the novel. An answer key is also included. Filming for the movie version of Stargirl took place in September-November 2018 in New Mexico. Disney plans to air the movie on their new streaming service called Disney+ in the fall of 2019. Stargirl is played by Grace VanderWaal, winner of the 2016 season of America’s Got Talent. Stargirl wins the oratorical contest making presenting speeches a great tie-in unit. Teach reading and analyzing speeches with movie clips. Click here for a free sample lesson. Lessons include identifying, analyzing and writing speeches. Choose between persuasive, informative, or entertaining speeches. Check out the Stargirl Book Unit with this free sample. The sample includes vocabulary, comprehension questions, and a constructed writing prompt for Chapters 1-3. 11 Comprehension Quizzes – These quizzes include multiple choice, sequencing, matching, and short answer questions. 15 Constructed Response Writing Questions – These are longer answer questions. Students can plan out their answers on the graphic organizers provided. Using the organizer, students write their answer in paragraph format. Choose between printable activities or go paperless with digital resources that are compatible with Google Classroom. Purchase the full unit on Teachers pay Teachers.